As as been somewhat unofficial now for several months, the Ski Train, along with two of its F40s, will be leased to Iowa Interstate for operating a shuttle between parking in Coralville and Kinnick Stadium. This will allow University of Iowa football fans to park for free in Coralville and be shuttled to the game itself, alleviating traffic congestion around the main UofI campus. Trains should start running this job on 4-Sep-2004 (the first home game) and end on 11-Nov-2004 (the last home game). For a full Hawkeyes schedule, see this page. Trains should start running two hours before the game and run through the first quarter, and then pick up again at the beginning of the fourth and continue until 90 minutes after the game. Fare will supposedly be $5 round trip. The train will be 11 cars and two of the refurbished Ski Train F40s, operated one at each end to eliminate any need to back or turn the train. 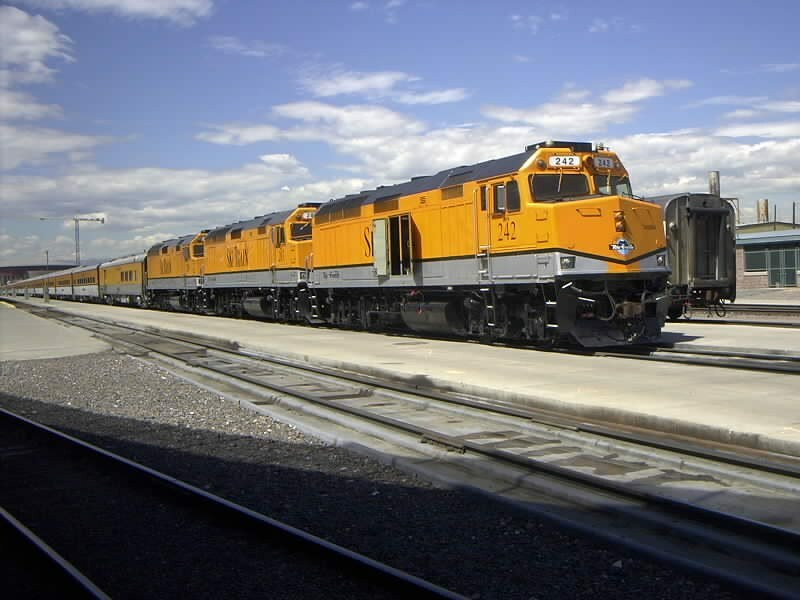 Delivery is expected via BNSF the Sunday before the first game (so 29-Aug-2004). Inside, the train will be staffed by local volunteers. For those not familiar with the Ski Train, it operates during the winter and for a few weeks each summer from Denver, CO, to Winter Park, just on the other side of the Continental Divide. It's a long-standing Rio Grande tradition, carried on by Phillip Anschutz after he helped sell/merge the Rio Grande into SP and then UP. Jim Griffin has an excellent Ski Train page detailing the modern equipment. The F40s (all three, all ex-Amtrak) can be seen in this photo, taken by Dave Sis on 11-Jul-2004 and used with permission (from DRGW.Net's Photo of the Day). From the "I can't believe we haven't come to our senses yet" department... The three finalists have been announced for operating the Georgetown Loop next year. The Denver Post has the story here.